Comic-Con 2012: What I hated, and what I loved. SAN DIEGO—For the most part, I’ve stuck to the comic-book-related panels here at Comic-Con. They are the raison d’être of the festival. Comic books are still the topic that seems to fuel the most passionate, thoughtful conversations—as witnessed at the 30th anniversary tribute to Love and Rockets, or the seminar on progressive politics in comics. It’s beautiful to watch the insular passion of the comic book obsessives—they are the warm, beating heart of the whole Con. Still, I worried I’d be missing out if I didn’t attend at least one panel devoted to filmed entertainment. 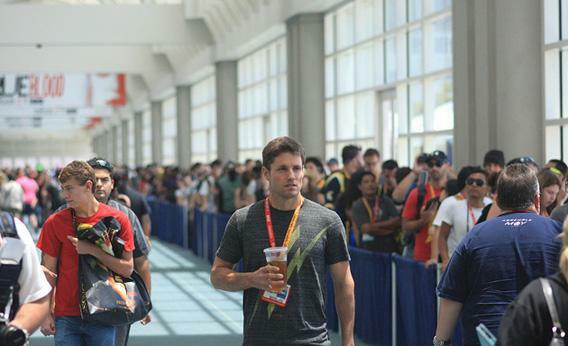 Comic-Con could never draw 130,000 attendees to a convention solely focused on comic books. The Con’s powerful place in the modern media landscape stems from its role as a showplace for the pop-culture-industrial complex—a place where TV networks and movie studios come out to play. With this in mind, I woke up Saturday morning determined to gain admission into Exhibit Hall H of the convention center. Hall H is the big kahuna—6,500 seats—where all the sparkly Hollywood stuff goes on. The first event scheduled on Saturday was at 11:30 a.m., when Quentin Tarantino would be presenting footage from his upcoming film, Django Unchained. To ensure I’d get a seat, I showed up four hours early to stand in line. Immediately it became apparent that I should have shown up at least seven hours early. The line was comically long. It flowed into a park next to the convention center, serpentined several times, wound its way through fretful hope, past mournful despair, and then hopped out onto an access road for 750 yards or so before twisting into an entirely different park. It finally terminated on a desolate, cracked-asphalt basketball court not remotely within eyeshot of the convention center entrance, where—and at this point I broke into an incredulous chuckle—it began to serpentine again, such that one had to trace 10 or 12 basketball-court-length switchbacks before making any forward progress. The guys who fell in line behind me were a cheerful, chubby trio, munching on breakfast sandwiches. One dude wore a “Joss Whedon Is My Master Now” T-shirt, and another wore a shirt that said, “Captain Filipino-America.” To pass the time, they named the full casts from every Star Trek iteration. Then they named all the actors who ever appeared on The Wonder Years. Then they began to play the six degrees game. Hours went by. Literally, hours, shuffling ahead a few feet every 15 minutes. Still these dudes were naming random celebrities, throwing in jokey one-liners as punctuation. When they hit a sticking point connecting Steve Gutenberg (“inventor of the movable type press!”) to Chris Pine, I was growing loopy enough to join in, and pulled off a sweet Danson-Schwartzman-Rogen-Bana string that seemed to win their respect. After that, I returned to silently trudging. In the William Gibson novel Pattern Recognition, the protagonist develops a physical illness spurred by the sight of the Michelin Man—a sort of allergy to the semiotics of commerce. By the end of the weekend, I was experiencing mild nausea at the sight of Batman costumes and Big Bang Theory T-shirts and fall-TV trailers. At people lugging around gargantuan bags of worthless freebies. At tie-in toys. There are lovely little gatherings here of people who yearn to emotionally connect over their favorite manga books and machinima and online cartoons. But there is also a sickness at Comic-Con. A pop culture pathology. I grew increasingly disgusted at the thought of all these people paying for the privilege of being spoon-fed gobs of entertainment gruel. Lapping it up. If you camp out overnight, we might show you a couple clips from The Expendables 2! Frankenweenie! Fringe! The Cleveland Show! Resident Evil: Retribution! Do you have a question for our panel? What was it like to work with Dolph Lundgren? Will the CG dragons be bigger this season? When is your character getting a love interest? Do you find the period costumes help you get into the proper mind frame on set? Sunday morning, the last day of the Con, I decided to give it one last whirl. On the heels of my failure to infiltrate Hall H, I was determined to gain entry to at least one tough-ticket event. I noticed on the schedule there was a panel celebrating the 20th anniversary of Buffy the Vampire Slayer. That’d do nicely. I actually liked the Buffy TV show. (What? My ex-girlfriend watched it, it was on all the time in our apartment. Anyway, it was good! Don’t make me get all fanboy defensive! Whedon forever!) Bottom line, this seemed like a situation where I wouldn’t feel alienated and could even boast a modicum of legit geek cred. I showed up five hours early. The line outside this smaller, roughly 2,500-seat ballroom was already at least 1,000 people long. Three other panels were scheduled to take place in the room before the Buffy panel started, but lots of folks were “preloading”—meaning they’d sit through hours of stuff they didn’t care about in order to guarantee themselves a seat for the Buffy reunion. Finally, it was Buffy time. A reel of favorite moments played, and I found myself laughing along with everyone else at the vintage Whedon-y goodness. The panel came on stage. James Marsters, who on the show played a vampire named Spike, delighted the crowd by recounting how he got cast, revealing his favorite Buffy quotes, singing Whedon’s praises, and regaling us with backstage stories. The key thing was: He clearly adored Buffy every bit as much as anyone sitting in the audience. He was, yes, a fan. I slowly realized I liked being there in that room, with him and all these other fans, together dipping back into this show as if it had never gone off the air. Eventually the lights darkened and there was a screening of the Buffy musical episode, titled “Once More With Feeling.” All 2,500 of us sang along. Isn’t pop culture awesome?